Yesterday I was sound asleep in my recliner. I lost the battle to maintain consciousness while watching a documentary about Kindertransport. A lover of history, I was fascinated. I was also heavily medicated and the medication won. It was a gorgeous day. The young neighbor boy had come over to mow my lawn. The windows and doors were wide open. The birds were chirping. It was pure bliss. We knew we were going to have a weather change. Anytime you have weather in the 70s and a prediction of a drop to the 30s you can bet a severe thunderstorm will pop up. That's why I have a weather alert application on my too-smart-for-me-to-operate cell phone and a NOAA weather radio. There I was, sedated to the point of snoring and drooling, fully kicked back in my recliner and sleeping through not one but two blasts of the tornado siren. Forget the cell phone and NOAA radio. The tornado siren is about a quarter mile from my house and is the sort of alarm they used to warn people of air raids during the war. Me? I was absolutely oblivious. Comatose. At this point my BFF and roomie, Barbara, decided to take the kid gloves off to get me to wake up. Apparently she had been using my name at increasing levels with no response. Knowing that I wake up swinging if touched she had to come shout next to my ear. "ROSEMARIE!! THE TORNADO SIREN HAS BLOWN TWICE. GET UP!" Now there are two important details to know if you want to visualize my response to her shouting. The first is that I was a volunteer firefighter for many years and got started back before there were pagers. We used a siren just like the tornado warning to alert firefighters to respond. I got really good at jumping out of my bed and into my turnouts in one fell swoop. Of course I was many years younger and many pounds lighter then. I didn't have degenerative disc disease causing me trouble then either. The other thing to know is that my recliner works off a motor. It doesn't lift me up but the foot rest comes up and down- albeit slowly- at the push of a button. It's great because the action of kicking a recliner back into position kills my neck and angers all my pinched nerves. It is not, however, the best chair to be in when you are old, fat, have a bad back and neck, semi-conscious and spring to life thinking the world is on fire. In a nano second I was airborn, like I had been shot from a cannon, and fully expected to land in my turnouts. Ha! I found myself on my hands and knees on my living room rug, remote controls scattering off my lap like they were alive and fleeing for their very lives. My recliner was still in the fully reclined position. Had Barbara been recording the event, it would have gone viral in no time. Dazed, confused and contorted in what had to resemble a special yoga position, I found myself yelling back. "Barbara, you scared the (place the unsanctified word of your choice here) out of me!!" "The tornado siren has blown twice already and there's a tornado in Science Hill." "(Use the same unsanctified word here)! We are there, that's us!" Now I am grasping why my roomie wanted me awake. As I tried to untangle my limbs and find something to help me brace myself and stand up, I look out the front windows and it doesn't look too bad. For a split second I think I haven't heard Barbara correctly. "Is Josh still here?" Barbara, who is scrambling to get the dogs safely in the hallway while gathering lights and radios says she thinks he went home. The tornado siren is blowing again. That means I have indeed heard Barbara correctly and the weather folks are serious. I went to the back deck to look at the sky and found Josh- iPod on and weed-eater going. "Josh, did you hear the tornado siren?" "Go home, Josh. Don't stay here and take care of my yard when the tornado siren is blowing!" Josh heads back to his house and I am looking to make certain he can get home without being caught up in anything. About that time police cars go with lights and sirens northbound up our highway. I look at the sky behind the house and it's not looking good. Barbara and I scurry around getting ready for the worst case scenario. Next the hail hit. 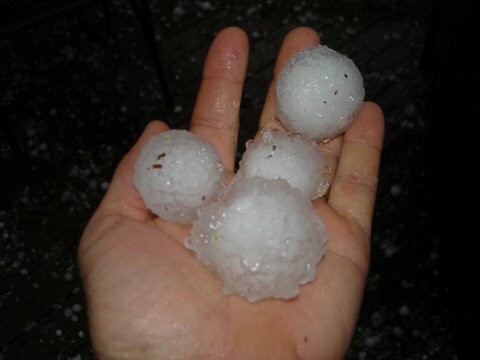 The hail in the picture is from the same storm but from a different house. Ours wasn't quite that large. Let me tell you though, when hailstones of any real size comes hurling down out of the sky with enough velocity that they bounce 5 feet high after impact your natural inclination is to step back from the windows. Your next inclination is to thank Almighty God that you are safe inside and ask Him to forgive you of those unsanctified words while confessing if the tornado comes your way, He's likely to hear them again. It's a sobering thing to know how completely helpless you really are and there's nothing like a storm or an earthquake or a tsunami to remind you that you are not in control of 'your' world. There was only one I could leave blank it was labeled "daughter" and since I have no biological children, I won't ever have to mark that box. There was also a place to check if you had been diagnosed with any other type of cancer. I have. I have 7.5 years cancer free. My sister was diagnosed with her cancer late last year. I would covet your prayers for her. Radiation has made her wounds difficult to heal. Sisters, I implore, beg and beseech you, if you haven't gone for your yearly mammogram or PAP, please go. If you've reached the big 5-0 and it's time for that colonoscopy, please get it done. No one in their right mind enjoys these things, but the cost of not having them is too high. Brothers you need to have your annual tests as well. Don't ignore symptoms if you have them. Don't try to tough it out. I fully believe that God ordains the number of breaths I am going to take and how I am going to leave this rusty broken down body. I believe the same is true for you, too. I also believe that being diligent about these tests will make the breaths I take easier and my time here more productive. I believe your time here is just as important. 4 For indeed while we are in this tent, we groan, being burdened, because we do not want to be unclothed, but to be clothed, in order that what is mortal may be swallowed up by life. 9 Therefore also we have as our ambition, whether at home or absent, to be pleasing to Him. Oh Rozie-I am so glad you are okay! I don't think I realized how much breast cancer had ravaged the women in your family. Bill's last living sister is in the process of scheduling surgery to preemptively remove her breasts-both of her sisters died in 2010 from breast cancer. She is going to wait until her daughter is married in the fall. One of her sisters was the age she is right now(53)when the cancer was discovered. Ha-I probably told you all this in channel yesterday-can't remember!